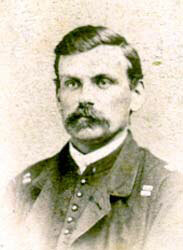 Images of Civil War officers wearing unusual grade (rank) insignia are not that uncommon. In some cases this may have been done to reduce the conspicuousness of the officer under fire. In 1864 the above quoted General Orders allowed officers to wear grade devices (marks of rank) on their shoulders rather than the more traditional shoulder strap. The General Orders are not clear exactly how this should be done and images suggest that different officers or their tailors interpreted the orders differently. Should a single pair of Captain's bars be worn or a set of two pairs? The above set of captains bars are believed to have been made to conform to G.O. 286 and the photograph shows a similar insignia in use.